NEW YORK, New York — Exposing Armenia’s physicians to western best practices medicine has quickly become a favorite project for many Armenia Fund USA donors. They recognize that quality health care starts with well-trained, up-to-date, professional staff. They have seen how the Fund’s initiatives in health care are already saving the lives of stroke victims through its neurosurgeon training program. And they understand that helping talented, dedicated doctors gain direct access to some of the top hospitals and doctors in America will pay many dividends for communities in the homeland for years to come. Building on the success of the neurosurgeon training program organized by Armenia Fund USA board member Dr. Arthur Grigorian, Armenia Fund USA is now facilitating training in emergency medicine. At present, patients without access to an ER are treated at a polyclinic. If they are victims of trauma, they go directly into surgery without the benefit of sophisticated diagnostic tests. Or, they are sent to another hospital, using up the precious time so critical in emergency care. Emergency medicine is one specialty particularly urgent in Karabakh and, all the more so, when doors open to new health care facilities, such as the Martuni regional hospital, which will boast a state of the art emergency room. “What good is all that new technology, if there isn’t the skilled, properly trained medical team on hand to use it?” asks Irina Lazarian, executive director of Armenia Fund USA and driver of the Fund’s overall health care effort in general and the physicians training program in particular. The deserving recipient of the first such “observership” in emergency medicine is Dr. Mher Musaelian of the national health center in Stepanakert, capital of Karabakh. Thanks to the efforts of another Armenia Fund USA board member Dr. Armen Arslanian, Dr. Musaelian is now visiting Winchester Hospital in Winchester, MA for a four-week observership program. Dr. Gregg Ciottone, chief of disaster medicine of BIDMC, visited Armenia years ago and came back with many fond memories. So he gladly helped arrange for Dr. Musaelian to shadow hospital physicians for various shifts at the BIDMC ER for trauma exposure. Dr. Musaelian will have ample opportunities to observe procedures, surgeries, patient histories and physical exams. He will also attend patient rounds, teaching conferences and enjoy privileges to the hospital’s medical research library. 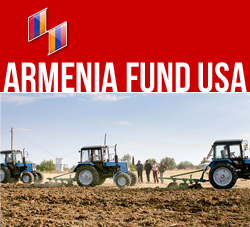 While the program itself is free of charge, Armenia Fund USA helped facilitate the visa process with an official letter of invitation as well as reached out to the community for in-kind support. For example, the family of Albert Hovanessian of Winchester MA has put out the welcome mat for Dr. Musaelian and are graciously hosting him while he is in the program. With so many established and well-respected Armenian-Americn medical specialists in our community’s midst here in the eastern region, Armenia Fund USA benefits not only from their professional connections but also their generosity of spirit.